South Plains College is approved by the Veterans Administration to offer a wide variety of college-level courses for the veteran student. Certificate programs, as well as associate degree courses that can be transferred to four-year universities, have been certified by the VA and meet all requirements for the veteran to be able to use his or her educational benefits. Benefits are specific to each student and the various types of benefits available can be researched online at www.benefits.va.gov/gibill. Veteran educational benefits are administered through the Financial Aid Office at South Plains College. For additional information and assistance, contact the Financial Aid/Veteran Advisor on the Levelland or Reese campus or the Department of Veteran Affairs at 1-888-442-4551. Eligible persons, who are listed below, are encouraged to apply for benefits six to eight weeks prior to beginning their first semester. Benefits can be applied for through an online website: www.benefits.va.gov/gibill. All veterans must apply for and receive certification of their benefits from the Veterans Administration in Muskogee, Oklahoma. Only the Veterans Administration can determine the exact benefits each veteran is eligible for and any specific questions regarding eligibility and benefits should be addressed to the VA at 1-888-442-4551. Benefits can include direct payment of tuition and fees to SPC from the VA, book stipends, and housing allowances depending on the benefit selected. Benefits associated with specific chapters of the GI Bill™ can be compared online at www.benefits.va.gov/gibill. If a member of the armed forces was killed in action, died as a result of a service-related injury, or has a permanent or total disability as the result of a service-connected incident, educational benefits are extended to his or her children under certain conditions. Under certain conditions, the widow or widower of a veteran or the spouse of a veteran with a permanent or total disability, as the result of a service-connected incident, is eligible to receive educational benefits. All veteran students must first be accepted for admission to South Plains College in order to utilize their veteran benefits. Applications can be made online at www.southplainscollege.edu. Eligible students must submit Member Copy 4 of their DD 214 to the Admissions Office. Copies of a DD 214 may be requested online at http://vetrecs.archives.gov/. The military transcripts will be evaluated for transfer of any possible college credits applicable to the veteran’s chosen degree plan. A copy of the student’s Certificate of Eligibility issued by the Veterans Administration must also be submitted to the Veterans’ Department. After the veteran student has been accepted to South Plains College, they will be required to select their degree plan with the aid of the Advising Center staff who will also assist the student with enrolling in the appropriate classes. Under certain circumstances, veterans are exempt from taking the TSI Assessment. However, if remedial classes are required and the TSI Assessment were not taken, the Veterans Administration will not include these classes in computing monthly benefits. The official student transcript maintained in the Admissions and Records Office provides a record of completed credits taken by all students each semester, as well as courses from which they have withdrawn. This office also maintains official drop dates and attendance records. 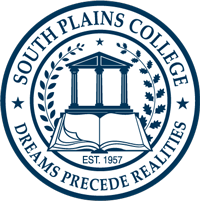 South Plains College requires students to maintain a minimum of 2.0 grade point average in order to remain in good academic standing. Students who fail to meet this requirement will be placed on academic probation for the following long semester. The student will be placed on academic suspension if he or she fails to make a 2.0 or higher grade point average while on academic probation. The Hazlewood Act was created to provide tuition and fee exemptions to qualifying veterans and their eligible dependents attending institutions of higher learning within the State of Texas. The exemption is intended to be used as payment for tuition and fees, with the exception of student service fees which are not covered by the Hazlewood Exemption. Certain continuing education courses may be covered by the Hazlewood Exemption. Please contact a VA Advisor for a list of these courses. Completed the HEA application for the exemption. Proof of VA Benefits Eligibility. No exemption of tuition and allowable fees is possible unless proper documentation of eligibility has been provided to and approved by the Veteran’s Department. Students MUST complete an application (HEA-CE) at the beginning of each semester that they wish to use the Hazlewood Exemption. All other documentation will carry over to future semesters with the exception of veteran students that have elected to use their Ch.33 (Post 9/11) benefits. The amount awarded under the Hazlewood Exemption combined with the benefits from Ch.33 cannot exceed 100% of the total tuition and fees. For example, if a student has been awarded 60% eligibility under Ch.33, he/she may only receive 40% of the total tuition and fees under the Hazlewood Exemption. The veteran is required to provide an updated award letter every semester for continued eligibility. Was a resident of Texas at time of entry into the service, entered the service in the state of Texas or Texas was their home of record. Provide proof that veteran’s death was a result of illness or injury related to military service or became 100% disabled for purposes of employability due to a service-connected injury or illness. Must be a Texas resident for the term they plan to use the exemption. Were a dependent when the parent was deceased. Provide proof of eligibility or ineligibility for Post 9/11 (Chapter 33) benefits by requesting an education benefits letter from the VA at (888)442-4551 or by applying online at www.ebenefits.va.gov. Must Not have a Default status on any student loans made or guaranteed by the State of Texas. Have attempted fewer than 150 credit hours of college courses using the Hazlewood Exemption. Submit a completed HEA application. If the child in the Legacy Program fails to use all assigned hours, the veteran may re-assign the hours to another qualifying child. The veteran may also withdraw the assigned hours at any time. Spouses are not eligible to receive the transfer of hours. All students must first be accepted for admission to South Plains College in order to utilize Hazlewood benefits. Required documents must be submitted to the Veterans’ Department for the semester which the student wishes to use the exemption. Applications (HEA) can be found on the Texas Veteran’s Commission website. Students may also pick up the application in the Veterans’ Department on the Levelland or Reese Campus. Proof of relationship to the veteran. The above requirements are required for determination of initial eligibility. Students will be required to submit the HEA-CE application for each subsequent semester they plan to use the Hazlewood Exemption. No exemption of tuition and fees is possible unless proper documentation of eligibility has been filed with and approved by the Veteran’s Department at South Plains College. 2. the governing board has specifically approved this benefit. The official standards of progress for Hazlewood recipients are available on the Texas Veteran’s Commission website. Please refer to their website for updated information regarding the Hazlewood Exemption. www.tvc.state.tx.us.